Our top of the range compost which is made up of organic additives and sifted to give a fine product ideal as a soil improver. It improves the water-holding capacity and humus content. Can be used on sensitive and non-sensitive plants. Our more economical line which has not had the final sifting but consists of the same ingredients as Master Compost. Ideal for breaking up clay or sandy soils. Both above can be used in the soil prior to planting, in planting holes or for bedding plants. Ideal growing medium for roses and shrubs that enjoy a clay base. Has excellent water holding capacity and also contains compost, vermiculite and fine bark, which improves humus content and soil quality. This product is based on spent compost from mushroom beds and can be used as those above. It is important, however, that it is not used on sensitive plants or in containers as it can have a high salt content. A nutrient-rich mix containing sand, compost and poultry manure which is ideal for leveling and feeding lawns. An ideal mix of bark, vermiculite, compost, soil and clay, which gives an excellent medium for outdoor containers. It can also be used as a general soil improver. Potting medium rich in fine bark and compost, with ideal drainage properties for indoor containers. Our economical potting mix, which is basically a soil and compost mix. 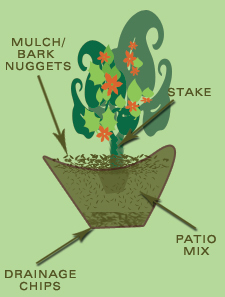 It can be used for less sensitive outdoor pot plants and as a basic filler for outdoors. This is a coarse, nutrient rich medium excellent for reducing water loss in summer and also for reducing weed germination. Can be spread around any plants and also enhances general appearance of flower beds. A superior outdoor potting mix ideal for patio containers. It has excellent drainage and water retention qualities and also has added natural nutrients. A special medium rich in fine bark and vermiculite and with polystyrene balls added to improve aeration and drainage. Natural nutrients have been added for excellent root and plant growth. A nitrogen rich manure which should be used with caution so as not to burn plants. Good as an organic food, high in Nitrogen. Excellent to make compost and liquid fertilizer. Our top of the range indoor potting medium, rich in decomposed bark, vermiculite and compost. Natural nutrients have been added for excellent plant growth. Ideal for rooting of cuttings and as an ingredient for making your own potting soils. A nutrient rich organic fertilizer. This product is ideal as a general purpose application for fertilizing of flower beds, trees and lawns. Can also be used in the preparation of new gardens. Ideal for enhancing the microbial activity in the soil. No chemical additives. Easy to apply and rich in natural macro and micro nutrients. Weed and odour free. We DO NOT accept CASH - only CREDIT CARD or EFT payments accepted.